Wash, peel, and slice ½ cup’s worth of ginger. Put it into a pot or kettle. Rinse 5 cinnamon sticks and put them into the pot. Add 7½ to 8 cups of water and boil for 20 minutes over high heat. Lower the heat to medium and boil for another 25 minutes. If it boils over, take off the lid. Add 1 cup of sugar. Stir and cool it down. 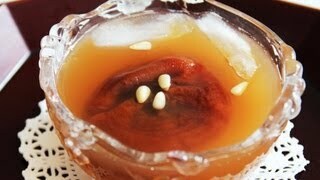 Remove the stem of the dried persimmons and wash thoroughly. Strain cinnamon sticks and sliced ginger in a colander. Pour it into a glass jar or glass bowl and add the persimmons. Put the lid on and keep it in the refrigerator for at least 12 hours. It will keep in the fridge for more than 1 week. Serve cold with ice cubes. Use a ladle to give each person a small bowl of punch. Each serving should have one persimmon in it with a few pine nuts sprinkled on top. Posted on Sunday, April 20th, 2008 at 6:17 pm. Last updated on October 5, 2014. Posted October 25th, 2016 at 1:34 pm | Log in to reply. Thank you so much for this recipe. I first tasted sujeonggwa at a Korean restaurant years ago, and I loved it, but I never thought I would be able to make it. Now I make it every time I have a sore throat- it really works! Thanks a lot Maangchi! Posted May 4th, 2015 at 7:33 pm | Log in to reply. Yummy! This is DELICIOUS!! It was 85 degrees today and when I got home from, it was SO refreshing and tasty!! Posted May 5th, 2015 at 12:18 pm | Log in to reply. wow, you are so good at Korean cooking! The soaked dried persimmon looks very sweet, soft, and flavorful! Posted May 5th, 2015 at 7:10 pm | Log in to reply. It is SOOOOOOO good! It’s good because your recipes are great LOL, thank you! Posted April 4th, 2014 at 8:22 am | Log in to reply. I am so excited that I found this recipe! This was one of my favorite things in Korea (though my boyfriend doesn’t like it), but it was hard to bring any back because they don’t have tea bags of it! Now that I found a recipe, I’ll be able to make it. Thank you! Posted September 19th, 2013 at 7:52 pm | Log in to reply. Just made this – it’s steeping in the fridge. Can’t wait to drink it! I noticed the ginger slices still had plenty of flavor after straining. I don’t throw anything away that I’ve already paid for if it still tastes good. So I removed the cinnamon, weighed the ginger and put it back in the pot. Then added an equal amount of sugar, a splash of water, and brought to boil. Then simmered for 20 minutes stirring frequently. When the liquid was almost gone and the ginger was getting translucent, I spread it out with chopsticks on a cooling rack set over a piece of foil. Now I have candied, cinnamon-spiced ginger as well as a yummy drink. I consider this a total bonus! Posted September 20th, 2013 at 1:21 pm | Log in to reply. Thank you for sharing the great tip with us! You can boil the ginger many times until it tastes nothing! : ) I love your frugal way! Posted April 16th, 2012 at 6:34 pm | Log in to reply. I am doing this for my geography class. and have about 30 people to serve can i put the pinenuts to the side and give them some if they want them and cut the persimmons into bite size peices so at least everyone can try it.. Or will it ruin the purpose? Posted December 14th, 2011 at 2:20 pm | Log in to reply. Posted January 1st, 2012 at 4:24 pm | Log in to reply. You actually dont remove any part of the pine nut, its the stem of the persimmon that you remove. Posted September 19th, 2013 at 7:54 pm | Log in to reply. Posted July 6th, 2011 at 11:38 pm | Log in to reply. Made this today. I couldn’t find any persimmons so I used apples and it came out great! Posted May 18th, 2011 at 5:35 pm | Log in to reply. Hi, Maangchi! I love your site. I tried making this and I think I overbrewed the tea. It has that feeling when you boil tea for too long. I followed the instructions. I used a kettle with the lid and spout closed. Did you use a kettle that let out steam while boiling? Posted April 21st, 2011 at 8:26 am | Log in to reply. Mangchi, I really want to make this drink…. how shall I prepare the persimmon? Posted May 19th, 2011 at 12:20 pm | Log in to reply. Posted August 17th, 2010 at 3:05 pm | Log in to reply. Posted August 18th, 2010 at 9:40 am | Log in to reply. This recipe was originally posted on April 20, 2008 at 6:17 pm by Maangchi. It was last updated on October 5, 2014. The video was watched 207,421 times on YouTube & has 1,114 likes!